Planning a Trip isn’t Easy: Here’s my Approach. 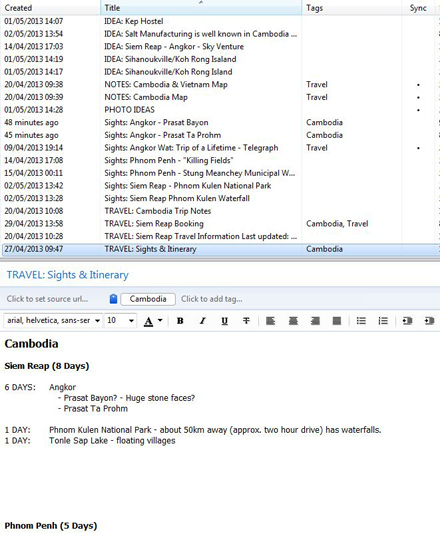 Well, it’s a long weekend here in the UK and so I’m determined to make the most of it by getting the framework of the Cambodia trip organised. I think I’ve all but decided that the trip will be to Cambodia only; reading around the web it felt as if four weeks for both Vietnam and Cambodia was going to be too rushed. Dedicating a full four weeks to one country means a more relaxed pace, better opportunities to capture sights in different light conditions and to make repeated visits to places. … and how many days to allow for internal travel. So the first step is hours in front of Google reading the official tourism sites, reading reviews from other travellers, search photo sharing sites for inspiration, reading about best ways to travel internally etc, etc. That’s a lot of information to store and manage and so you need a good system to keep it in order. I use Evernote to capture and store large volumes of information. It can be free to use, it can be accessed from the web, from your PC and laptop, from your mobile devices and it automatically synchronises changes amongst all of these. It also has a handy browser plug-in that allows you to not only grab a web page, but it also automatically stores the URL so you can always go back to the page at a later date. Everything gets stored in Evernote: Booking confirmations, possible ideas for shots, sights to visit, reviews by other people, questions to find out answers to, maps, bus timetables. Everything. Organisation is key for me, but so is simplicity. I like to prefix each note’s title with an indication of its nature. Ideas for things like where to stay or things to do get the ‘Ideas’ prefix; if an ‘Idea’ becomes a definite thing to do, it gets turned into a ‘Sight’; anything related to travel to, from or between places, or hostel bookings get the ‘Travel’ prefix. This way I can see pretty much instantly what is outstanding and when the time comes to plan a day-by-day itinerary I can look for everything marked a ‘Sight’ and make sure they all get included. So, that’s this weekend. A lot of web surfing and note taking using Evernote. But by the end of it, I should be in a position to book flights safe in the knowledge that I’m going to see everything I want to. It’s not set in concrete yet, but I have a strong suspicion that I’m off to Cambodia and Vietnam later this year. It all started with a idle contemplation of historically significant sites that I would like to see. The two that kept floating to the top of the list were Machu Picchu in Peru and Angkor Wat in Cambodia. Whilst Machu Picchu is still very much a place I want to see and the Inca Trail a walk I very much want to do, Going back to South America would mean going back to Bolivia and also down to Patagonia. A lot of preparation and perhaps best left for another time. My interest in Angkor Wat stems from a photograph I saw years ago where a tree was growing on top of an old temple. ‘Just how cool is that!’ was my initial thought. At the time I wasn’t really into taking photographs and I certainly didn’t have the courage to travel alone outside of an English speaking country. So there it stayed: a very cool image of what be a very cool place. Still, these days I have no real problem travelling outside of my comfort zone and not being able to speak a language sometimes work better. And, to be honest, whilst the expense of Antarctica last year left me telling all and sundry this year would be a quiet (i.e., cheap) travel year, I’m already getting itchy feet. But the deciding factor was when I nearly bought a new MacBook Retina a couple of weeks ago. Twice it ended up in the shopping cart and twice I thought about all the places I still want to see. If I had money for a new laptop, I certainly had money for travel. Still lots of preparation to be done. The first hurdle is whether it’s affordable. Yes is the probable answer. Flights there and back will be by far the majority share of the total cost as once there accommodation and daily living is cheap, especially for how I like to travel. The next hurdle is time. It’s a 13 hour flight and so I’m not looking at a two week break. Initial plans were for three weeks, but now Vietnam has crept into the itinerary, I’m looking to take the maximum I can. So when I asked my boss the other day “I’m looking at taking October off on holiday” I wasn’t kidding. In reality I’m looking at 24 days holiday, so nearer five weeks. It’ll be the longest trip I’ve ever been on. The boss has tentatively agreed, although official confirmation is still to come. On the plus side, it would appear that Adrian, one of the people I used to study Japanese with now lives in Cambodia, which means lots of tips and insider knowledge. Also Teja at work spent several weeks in the area last year, so more useful tips of what to see and avoid.